Roadcheck 2018 is only days away: Are you ready? You may have a greater chance of experiencing a roadside inspection the first week of June as the Commercial Vehicle Safety Alliance (CVSA) holds its annual Roadcheck event. The event — slated for June 5-7, 2018 — is a 72-hour inspection blitz of commercial motor vehicles and drivers throughout North America. Each year CVSA selects a compliance area of emphasis. This year’s Roadcheck will focus on hours-of-service (HOS) compliance. This is the first Roadcheck since full enforcement of the electronic logging device (ELD) mandate began on April 1, 2018. What happens if you’re caught without a required electronic logging device (ELD)? A new enforcement policy lays out the consequences. Drivers who do not have an ELD or a grandfathered logging device when required will be placed out of service (OOS). The OOS order will remain in effect for 10 hours for truck drivers or 8 hours for drivers of passenger-carrying vehicles. At the end of the OOS period, the driver will be allowed to travel to the final destination using paper logs, and should not be dispatched again without a compliant logging device. The dispatch number will be recorded on the roadside inspection report to verify that a driver has not been allowed to start another dispatch before installing and using an ELD. After reaching the final destination, if the driver is dispatched without obtaining a compliant ELD, he/she will again be subject to the OOS procedures. However, a driver may return with an empty CMV to his/her principle place of business or home terminal, as indicated on the roadside inspection report. If the driver is dispatched again without an electronic log, he or she may be placed OOS again and “the motor carrier will be subject to further enforcement action,” the FMCSA says. Note that the ELD mandate that went into effect on December 18, 2017, did not change any of the underlying hours-of-service rules but did place a spotlight on hours-of-service compliance — a spotlight that makes it much easier for officers to find violations. 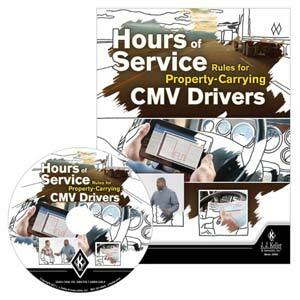 J. J. Keller's Hours of Service Rules for Property-Carrying CMV Drivers - DVD Training includes all current Hours of Service rules drivers must comply with.